Wholesale Metal Name Badge Clips - On Special Sale Now! The metal name badge clips come with round rivet holes for rivet mounting. The metal name badge clips can be mounted on name badges, ID cards or small accessories with rivet machine. Great for manufacturing applications or put on round cords directly. 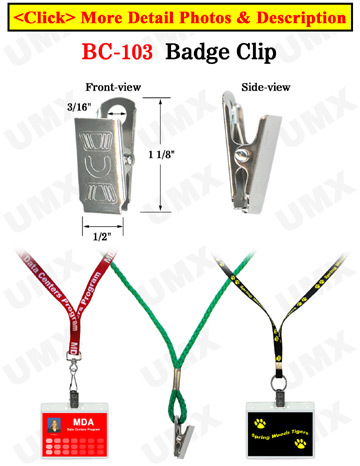 We keep large quantity of metal name badge clips for wholesale with low cost. Custom size badge clips available - please call.